If you want an amazing show at your wedding this is the band for you!!! I saw them at Waxys Leominster and at Plainridge Casino trying to make my mind up about a band!!! This band gave me chills every performance was different and then the male singer decides to sing Pavarotti i sent to my Mom and she did not believe he was really singing this group is AMAZING!!!! To hear peoples comments under there breathe is funny too. "o my god they are better than people on the radio who the hell are they" we won a free Dj for our wedding cause they have a wedding on my my day already :( but i am officially a groupie for this band i had to leave a review. I saw 10 bands and NO OTHER BAND COME CLOSE TO THE VOCALIST NO OTHER BAND!!! DaveMacklin what a great band!!! Keep pressing on PEACE LOVE AND FUNK!!! Wow Tim! Thank you so much for your support and coming out to see us and for taking the time to leave such an amazing review. We are truly humbled. We love what we do and feel very passionate about giving our fans the best music and vocals we can at every show. So glad it reaches our fans deeply! Hope to meet you one of these days. Please come up and say Hello! Peace, Love and Funk! We just hired the Dave Macklin band for a New Year's party. They had everyone dancing all night long. Great folks to deal with. Very accommodating, easy to work with and just overall nice people. And of course graest music!!! Thank you very much Mary! You threw a great party and we are glad all your guests, including the man of honor, had a great time! It was our pleasure! I booked Dave Macklin Band without ever seeing them live, and I'm so glad I took the chance and did. The music (for both ceremony and reception) was perfect; I wouldn't have changed a thing. They were professional, responsive throughout booking, and so much fun. I would highly recommend them! Thank you very much Robyn! It was truly our pleasure and honor to be part of your special day! Best wishes from all of us! I am not being biased because this was my wedding but this band was one of the best I have ever herd! We never saw them in person before the wedding just watched YouTube videos.Very reasonably priced and so talented! They played all the songs I wanted and did such an amazing job, engaged the crowd and all of our guests commented on how great the band was! They even broke out in Italian Opera! I highly highly recommend! Stopping by to say Thank you very much Amelia! The pleasure was all ours! Best wishes from all of us! You will NOT regret hiring the Dave Macklin Band for your event, especially your wedding. One of the most important aspects of our wedding we knew would be the band and the Dave Macklin Band did not disappoint. We went to listen to them a couple times before booking them for our wedding. Each time we went to listen the blew us away. Irene, their manager, and Dave's wife is super easy to work with. And they are extremely affordable, which is always a plus! The band is all around unbelievable. Their voices are unbelievable and really make the night something special. Dave and Gisela have amazing voices - voices that will have your guests talking for weeks afterward. They also have a horns section of their band which really made it that much better. They had all of our guests on the dance floor before my husband and I had a chance to make our way around the venue to say hi to everyone. And they had us dancing all night long. It was an amazing night and they definitely helped make it that way. Thank you, Dave Macklin Band for make our wedding a night to remember not only for us but for all of our guests! DMB was tremendous in helping us plan our wedding reception, and in playing three unbelievable sets for us and our guests. We can't wait to go see them again, and hire them too if we have the opportunity. Couldn't have asked for better music or played by a better group. Dave Macklin Band is amazing!!! They were very interactive with our friends and family and had everyone on their feet dancing all night!!! They played a variety of songs including opera, funk, reggae, all the way to hip hop!!! We could not have been happier with the band!! We are very thankful to have chosen such a fun group that was ready to have a good time! Dave Macklin Band MADE our wedding day! Working with Irene was easy - she was very responsive and flexible with our needs. I asked for the band to provide sound at our outside ceremony and they went out of their way to accommodate our requests. They had everyone dancing from start to finish! I still have people asking me where I found them! Worth every penny we saved for them! I couldn't have been happier with the amazing dance music they chose to play. Each musician was extremely talented and skilled. If you're reading this and shopping for the best wedding or event band, look no further! DMB is the BEST! Thank you so much Kristen! Very happy for you and Than! Just go ahead and book them right now- it will be the best decision you make! The Dave Macklin Band played at my wedding this past weekend and completely MADE the party. From the beginning they were easy to work with, attentive, and even learned special songs for us. You will not find a better wedding band and we will definitely hire them again and again for other parties. Our guests raved about the band and we are still getting compliments about them days later. They had the crowd dancing all night. We can't wait to see them again! The Dave Macklin hands down is the best band around!! I hire them 1 month before my wedding date 6.23.17 for cocktail hour and they were on it. One week before my wedding the person who was suppose to sang my song A moment like this told me she could not any more. The Dave Macklin Band step right up and sang my song!! 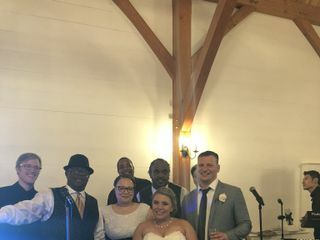 My wedding by far was the best wedding I ever been too!! And all thanks to the Dave Macklin Band!! I would so hire them again!! Love this band they had my cocktail hour live!! Thank you so much for having us be part of your special day Tamisha! So glad we could accommodate you and everything worked out beautifully. Congratulations!!! HIRE THIS BAND FOR YOUR WEDDING. They were absolutely amazing to work with, even learning brand new songs to perform for our first dances. But on top of that, they are INCREDIBLY talented. We are both musicians (and many of our friends/family are as well) so our standards were really high, and they did not disappoint! From the singers to every instrumentalist, I've never heard a better wedding band. The dance floor was packed all night and everyone was singing along. Their set list was perfect. Their charisma was awesome. The Dave Macklin Band MADE our wedding -- thanks to them for an incredible experience!!! Thank you so much Sarah! We are so happy for you and pleased that we were able to make your wedding day so memorable and fun! You were pretty darn good on that Etta James song yourself!!!! Thank you very much Evangelos! It was a great event and we had a great time! I HIGHLY recommend Dave Macklin Band to any couple looking for entertainment for their wedding!! Irene was super responsive when I initially contacted her with questions and was SO easy/ flexible to work with during the entire planning process. I went to see the band live at one of their events prior to my wedding and was blown away by how talented they were and how they literally had the entire restaurant on their feet dancing the entire night! Of course, they had my entire wedding party on the floor dancing the very first song they played and every guest is still contacting us to let us know how amazing the band was. They made our wedding the night the most memorable night of our lives and played the perfect mix of music for every age. They even learned multiple Sam Cooke songs for our special dances just for our wedding! Dave Macklin Band is the best band in the Northeast and I recommend every couple to book them for their wedding entertainment! Thank you so much Mimi for taking the time to leave us a great review. We take our job of providing the best live entertainment for all very seriously and are truly thrilled that we contributed to making sure your wedding reception was a great success. Much love to you and Art from the Dave Macklin Band! I saw this band Dave Macklin Band at the Scallop festival I stood all the way in the back and could not leave as each song was delivered like no other band and Vocalist. Lets talk about the Vocalist AMAZING. Dave Macklin 'You'll never find" just like the song. The Male singer from Bermuda is definitely a DIAMOND IN THE ROUGH I have seen many bands over the years and this young man from Bermuda repertoire was IMPRESSIVE his ability to sound just like the recording was mouth dropping but when he did PAVAROTTI I called my husband who is a booking agent for Florida High End Clubs he was impressed from what he heard over the phone. I am hoping he would be in touch the DMB soon. This band NEED TO BE TOURING THE WORLD!! I encourage any bride to book this band. They deliver a Stadium Performance and such humble singers. Voice like the lead singer you think he be big headed NOPE the most humble man with a voice a gold. DAVE MACKLIN BAND SKY IS THE LIMIT!!!! The Dave Macklin Band was amazing. They worked with us to play the kind of music we wanted and definitely delivered. They got almost every single person on the dance floor for the entire night. We had such a fun wedding and so much of it was because we had great music. Thank you very much Caroline ! We really appreciate that.! The pleasure was all ours! Congratulatiions! Peace Love and Funk!!!! DMB rocked! We were 100% satisfied. Our guests were raving about this group of talented performers and the dance floor was packed all night. From the initial quote to the special night, we felt assured we were in good hands and confident the band would deliver. The band added a killer horn section and navigated the cape cod traffic to be ready to rock on time for our Friday night party. Their range of songs and funky style can't be beat. I would recommend DMB to anyone and everyone. Thank you so much Matt! We had such a great time with you and your family and friends. Thank you for making us feel like we are part of your family! Dave Macklin Band performed at my elegant birthday event and they were spectacular! The band played the music I recommended, engaged the crowd, and kept the party lively from beginning to end. I would definitely recommend The Dave Macklin Band for any event. They truly catered to my needs!!! Thank you Aishia! So glad we were able to make your elegant birthday party extra fun and special. We had a great time! It was an awesome event! Hope to see you soon at one of our shows. The Dave Macklin Band was outstanding. 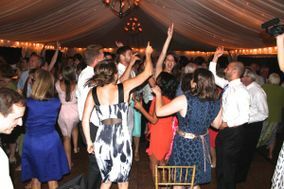 Our guests were dancing all night, and the energy level of the reception was off the charts, all thanks to the band. During and after the wedding our guests could not stop complimenting the band and how great they were. Prior to the wedding, DMB worked with us to finalize details regarding song choices and requested music. Seriously, we cannot recommend them enough, hire this band if you are looking for a great event! Dave Macklin Band was absolutely AMAZING. There were three things that meant the most to us for our wedding: food, drinks, and a great PARTY!! We LOVE to dance- so finding an amazing and affordable band was important to us, but was an overwhelmingly difficult task- especially planning a wedding from 16 hours away! Once I heard Gisela's voice on their website- I KNEW they were high quality- anyone that can sing (and sing well) Whitney Houston HAS to be good. And she was!! Talk about a powerhouse!!!! Absolutely amazing. DMB ROCKED our dance floor!!!!! EVERYONE was dancing- my 92 year old uncle to my 12 year old cousin.. They played everything we asked for- and were absolutely spot on with the break tracks- they MCd the event- and the flow was incredible! I was afraid of a choppy run of the mill wedding- and this was far from that!! So relaxed and fun. They even learned jesses girl for us- a suprise for my hubby when they handed him he mic and brought us on stage! It was incredible. Irene is so easy to work with, and they worked with us on an affordable rate. We are 3 months out from our wedding and are STILL getting comments on the band!!! They rival- and are truly better- than many $6-10,000 bands out there!!!! They seriously MADE our entire wedding. I would recommend them over and over!!!! Thank you DMB for making our wedding absolutely amazing! Absolutely wonderful! Everyone was dancing all night. They really brought and kept up the energy up! Very easy to communicate with. Very professional. The Dave Macklin Band was extremely professional from start to finish. Any changes that I had, right up to last minute details, they delivered. They sure know how to get the party started!!! Everyone at the reception was on the dance floor DANCING, like the way it should be!!!! I would hire them again in an instant!!! Thank You, We all had a blast!! !